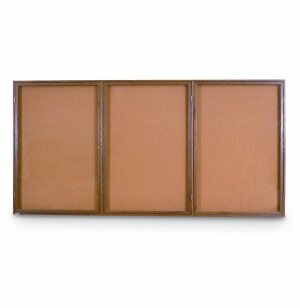 A large enclosed bulletin board turns your whole hallway into an excellent space for hanging up papers. Built-in illumination ensures that your messages will be noticed and that they can be read from far away. Wood Framed Enclosed Cork Boards offer the convenience of a bulletin board in a style that is appropriate for both professional and educational settings. Solid oak frames in a selection of finishes put a classier twist on this classic display option. With this design, you can easily tack, staple or pin up fliers, posters or announcements while maintaining the visual appeal of your space. An enclosed bulletin board is only as useful as it is secure. You want to make sure that everything you hang up stays put until you are ready to replace it. Locking shatterproof acrylic doors keep all of your announcements in clear view while ensuring that they will not be tampered with. No matter where you need hanging space, United Visual cork boards are an excellent option. Easy Viewing: This cork board is illuminated by fluorescent from the top to highlight your information and announcements. 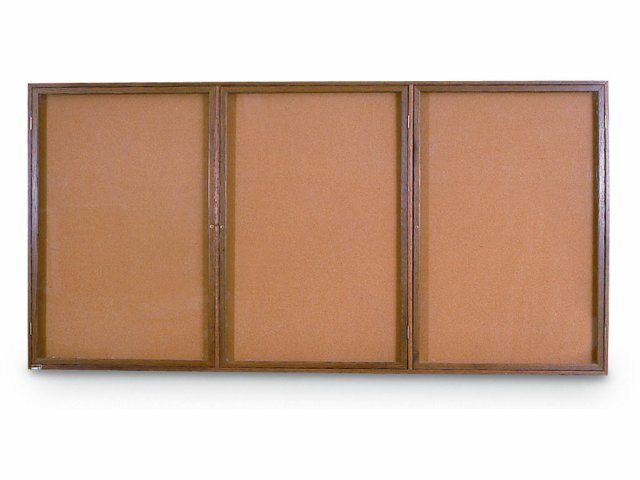 Quality Materials: Solid Oak frames with a rich walnut stain enclose these self-sealing natural cork boards. Secure Protection: Shatterproof acrylic doors have heavy-duty, disk-tumbler locks for superior security (two keys included). Wide Selection: Available in various sizes, so you can find a great fit for any space.